West Point Tool & Molding is a privately owned injection molder and tool manufacturer that specializes in building precision tooling, (AKA injection mold) for the plastics industry. Located in the thriving city of Houston we are your go-to source for injection mold production and tooling. With over 50 years combined experience we offer new tooling, molding, production and comprehensive consulting services that will ensure that your injection mold meets your specifications and our stringent quality control measures. We have established long-standing relationships with local vendors and suppliers to allow us to get you to market as quickly and efficiently as possible. We truly love what we do and you will not find a more responsive group of individuals on the planet. “We don’t have to do this, we get to do this”. With the finest CNC technology available you can do remarkable things. Couple that with MasterCam CAD\CAM software and the best manual machine tools available and you’re on your way to making a name for yourself in the injection mold tooling industry. That’s what we’ve done and it’s a winning combination. We’ll put our injection mold making experience and investments to work for you. Striking the optimal balance between injection molded parts and tooling cost and performance is not difficult. It’s simply a matter of learning what you want to achieve with your injection mold tooling investment. 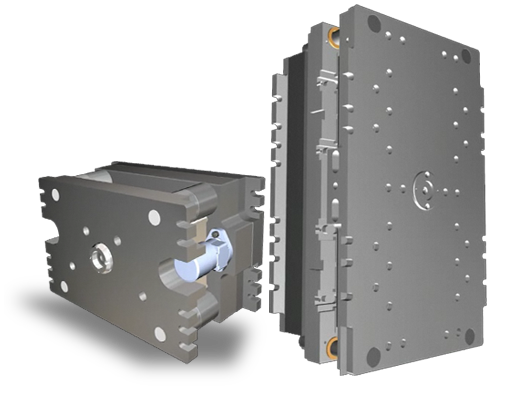 We’ll strictly adhere to SPI proven injection mold building standards to get that great American Made injection mold quality but are able to custom build the injection mold tooling in a way that best suits your quantity requirements as well. And we’ll explain the why and how the injection mold should be built. While some details of your injection mold production and tooling requirements can be ironed out over the phone and through email conversations we’re excited to meet you, sit down together and go over the finer points of your project. We’ll offer solutions and make recommendations that will best serve your specific injection mold requirements. Innovative tooling concepts along with great customer service set us apart from the competition, foreign or domestic. We think you’ll agree.